I've been playing around with some image scaling stuff tonight and came up with the following. I'm interested in your opinions. In this post, tepples talks about doubling the image size with nearest-neighbor interpolation before performing any additional resizing with bilinear interpolation. The method I came up with is essentially an extension of this idea, except that it's done in one step and the amount of bilinear interpolation is adjustable (hence the 'fractional' in fractional bilinear filtering). The implementation is pretty simple. Here's the shader code. If you'd like to play around with it, I put together a demo app. Use the up and down arrows (or page up/down) to adjust the amount of interpolation. DX10 (Win Vista+) is required and you may need to download some libraries from Microsoft if you get messages about missing dlls: MSVC++ redistributable and the DirectX runtime. Last edited by James on Wed Jan 08, 2014 9:16 pm, edited 9 times in total. In that post tepples describes I believe a practical way to achieve the following (and additionally how to achieve it with other filters like Scale2x, without rewriting any of the filter code). Overlay the output display pixel grid over the NES pixel image. Wherever an output pixel covers part of only a single NES pixel, output that color. Where an output pixel covers more than one NES pixel, mix the colors in ratios equal to the relative areas of the overlap. 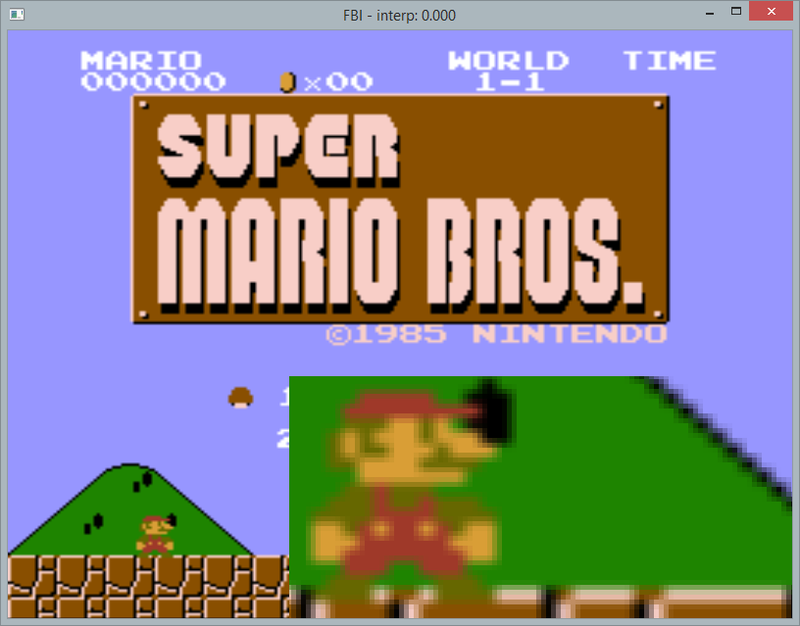 This results in sharp-edged blocky pixels with minimal inconsistencies in appearance, even when the NES image is being expanded into rectangular pixels on an output display only slightly larger than the original NES image, e.g. 256x240 to 584x480. Vertically there will be no mixing. Horizontally there will only be at most one pixel of intermediate mixed color between two pixels. Examining more closely, consider the case of expanding a 4x1 image (in) into 10x1. The output pixels will consist of in, in, in*0.5+in*0.5, in, in, in, in, in*0.5+in*0.5, in, in. If the output were 100 pixels wide, the output pixels would be each input pixel repeated 25 times, without any mixing. With linear rescaling there would be massive mixing of most pixels, making it a big blur. Thinking more about this, it gets at the core of the basic meaning of a pixel image. Is it a set of infinitely-small samples at the center of each grid rectangle, or is it a representation of the color across the entire grid rectangle? The former is the interpretation that leads to linear (or similar) interpolation, while the latter is what leads to the rescaling described here. In a way, this is what nearest-neighbor scaling is a poor approximation of. Can your shader do the above? Yes; at sufficiently high levels of interp_adjust (this is at .3), there is no mixing between edges on axes scaled by an integer ratio. On axes scaled by non-integer ratios, mixing is limited to one pixel. Nice. Apologies for one more request, but I lack Windows. What happens when you use interp_adjust of 0.3 with an X scaling of say 4.9? Still only one-pixel-wide mixing between pixels? No worries -- I'm happy to discuss and try out stuff. What happens when you use interp_adjust of 0.3 with an X scaling of say 4.9? Still only one-pixel-wide mixing between pixels? interp_adjust needs to be increased with higher scaling factors. 8x scaling needs about .425, for example. It should be easy to programmatically determine the optimal value. I'll work on that. So interp_adjust appears to set the flat area of each texel in units of the width of 2 texels. In that case, the optimal value would be (scalefactor - 1) / (2 * scalefactor). This works fine as long as the horizontal and vertical scale factors are within 1 pixel/texel of each other, such as most uses on NES. But what happens in SNES pseudo-hires mode, where the horizontal and vertical scale operations need separate interp_adjust values due to the decidedly rectangular (4:7) pixel aspect ratio? In any case, TVs themselves introduce blurring, and interp_adjust = 0.25 might produce a more accurate simulation of a PlayChoice, RGB SNES, or component Wii. Yep -- this works well. Thanks. But what happens in SNES pseudo-hires mode, where the horizontal and vertical scale operations need separate interp_adjust values due to the decidedly rectangular (4:7) pixel aspect ratio? I knew I'd seen something like this mentioned somewhere before, and i guess ImageWorsener's documentation calls itpixel mixing. Yeah, I guess it is the same thing. So much for fame and fortune. In any event, I've incorporated it into the latest release of my emulator. Can't really comment on accuracy, but just a bit of blurring looks better, I think. I've included a sharpness adjustment to allow for this. It's great that you added a blur adjustment, to go from no mixing at all, one-pixel-wide mixing, or full bilinear. And it's a shader, so less CPU load. As far as I can tell, it's still rare for an emulator to support this kind of rescaling, so you can preserve the aspect ratio and still get sharp pixels. This works with any hardware accelerated API that supports alpha blending (Direct3D, OpenGL, etc) and does not require any pixel shaders. Of course if you have shaders, there are much better techniques. Fes' pixellate shader is particularly impressive, for instance. It's effectively the absolute minimum blurring needed to make non-even-multiple scaling look perfect in pixellated form. Fes' pixellate shader is particularly impressive, for instance. It's effectively the absolute minimum blurring needed to make non-even-multiple scaling look perfect in pixellated form. Assuming that you're talking about the pixellate shader distributed with higan, this method produces identical output. edit: identical output in center mode, but mine looks better in scale and stretch modes. I can't compare GLSL to HLSL to verify that claim, but it sounds very impressive! Would you consider writing your shader in GLSL? None of my primary PCs support Direct3D, and even on my Windows build box, I've removed HLSL support in an effort to promote portability. I've changed the uniform names and use GLSL 1.5 (no fixed functions), however. I can ask on my forum for a port and post if back here if that's okay with you, too. Does OpenGL work on Windows RT and Xbox One? I was under the impression that these were supposed to be "legacy-free" platforms, and OpenGL was legacy. Perhaps someone is aiming for a publisher to use this to port old software to new consoles, just as Atlus, Jaleco, and Konami used PocketNES. There's something wrong with it; it looks blurry.